German Shepherd breeder ads will now be organized here by state or region for your convenience. We are dedicated to the German Shepherd dog breed and this GSD listing service is intended to serve only as an informational resource for all the visitors of Total German Shepherd. It's not uncommon for us to get multiple email requests each week asking us if we know of a German Shepherd breeder in Nevada, or Kentucky or Canada or South Africa or Italy... that we could recommend to them. That's exactly why we created this page - to help our readers. Keep in mind that any GSD breeders listed on this page are provided for your convenience. For more information on each individual listing, simply click on their banner. We would also like to take the time to invite other German Shepherd services to advertise here too. If you're a dog trainer that specializes in German Shepherds, a groomer that deals with larger breeds of dogs, a veterinarian that knows all the ins and outs of the GSD, or maybe even a kennel that boards dogs and has a lot of experience with German Shepherd Dogs in particular, we welcome you too. After all, people looking for breeders will be in need of other dog services as well sooner or later. Note: Total-German-Shepherd.com does not endorse any of the animals or GSD breeders available on this page and I encourage you to exercise care in selecting any German Shepherd Dog breeder or puppy. I highly encourage you check references of any GSD breeders you are interested in as well as any warranties or guarantees that the breeder may offer on their animals. I also encourage you to check with any potential GSD breeders you are interested in more than 2 or 3 times before you make your puppy decision. 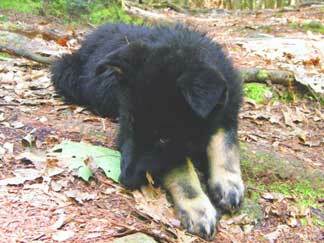 Total-German-Shepherd.com urges you to request a written contract whenever purchasing a puppy. Please understand that Total-German-Shepherd.com does not provide any warranties of any kind, express or implied, in connection with the services offered by the breeders listed below, including warranties of health, fitness, etc. Note: Links to other web sites may be provided as part of these listings as well. You should understand that any third-party web sites linked to from this page are operated and maintained by the respective owners of their own site, which are solely responsible for their content.